Another Crazy Star Wars Rumor! Plus Did The Stand Movie Find Its Star? 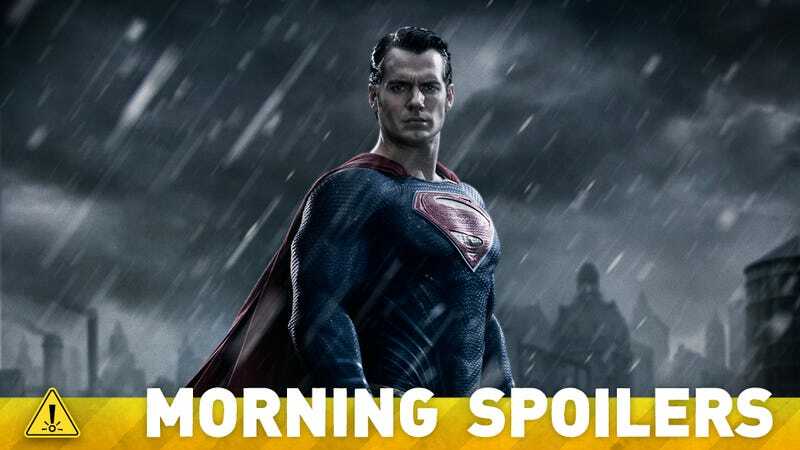 Could Superman actually face the music for his actions in Man of Steel? The members of Amazing Spider-Man's Secret Six may not be whom you're expecting. A Doctor Who rumor gets an intriguing non-denial. See tons of clips and promos for Gotham, Doctor Who, Defiance and Star Wars: Rebels. Spoilers right now! Another day, another Star Wars rumor. Latino Review cites two anonymous sources who say that a major villain from the other movies will be back: Emperor Palpatine. There will be new villains in this series, but Palpatine will be "pulling the strings" of everything, from behind the scenes. Meanwhile, there's an intriguing theory about the source of some of the latest Star Wars rumors, about Daisy Ridley finding Luke's light saber. StarWars7News points out that these rumored storylines sound awful similar to Volume 2 of the Dark Horse Comics series Star Wars: Legacy, which follows the descendent of Han and Leia, Ania Solo. Ania's story is of particular interest here, because many of the rumors that we've heard so far sound like they were taken out of pages of this comic. To begin with, Ania Solo begins her story on a backwater planet running a junkyard along with her Mon Calamari friend Sauk, when she discovers a lightsaber. She then learns that she's been marked for death, and she and Sauk escape from an Imperial Knight called Darth Wredd, a cyborg. They then escape the planet and go on a series of adventures that allow them to join forces with a former Imperial Knight named Jao Assam, all while trying to evade Wredd, Empress Marasiah Fel, and other Force-Sensitive Imperials, eventually crossing paths with Cade Skywalker at a crucial point in the story. His work on wormholes ... was notable because they were the first ones to figure out how to mathematically describe one. That is crucial if you want to understand how wormholes might behave, or if you want to know how wormholes might appear so you can look for one in the universe. The truth is … I don't want to tell you the truth because I quite like these rumours. I think it's really interesting because, suddenly, people don't know what's going to happen in the series, people don't have any idea, so this speculation is quite good. People can now watch the show not knowing if I am or not, and that is quite exciting. Stephen Amell offers an update on the new season's filming, saying episode 50 wrapped with a "scene two years in the making." Claire has an unexpected meeting with a British general; Capt. Jack Randall is determined to uncover Claire's secrets. Claire and Jamie's unfolding marriage causes deeper feelings to arise; Claire finds herself torn between two men in different times. Frank searches for his missing wife; a life-changing opportunity arises for Claire as she attempts to come to terms with her marriage to Jamie. Here are some promotional photos from episode four, "The Gathering." A lot of has been establishing what goes on between Claire and Geillis and as Claire spends more time [in 1743], she also has to reveal a bit more about herself and in later scenes, you'll see that Geillis too has to show her true colors. Those scenes were particularly interesting to shoot with Caitriona. For the people who know the books, you know what I'm talking about, but for the rest, towards the end, the character of Geillis really does surprise you. She does keep surprising us and even for me, I don't know what's to come [after the first season]. It's been an exciting trip for me. Horowitz tweeted the title of episode five of the new season, "Breaking Glass." And here are some new behind-the-scenes photos, tweeted by MingNa. Here's the blurb for the second season of this show about people miraculously coming back from the dead: "Weeks after the flooding, in a town now run by the authorities, life goes on. The survivors of the Helping Hand are the only ones who know about the existence of The Returned. Some are willing to do everything they can to find them." Additional reporting by Ryan Plummer.